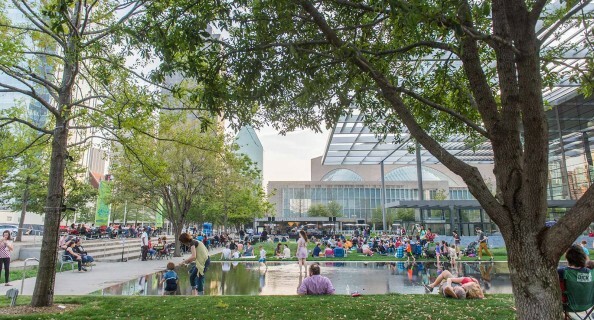 “Where are you going?” asked Dallas’s favorite classical DJ Amy Bishop, as I was heading straight into Meyerson Symphony Center, which would have been great had I been planning to go see Jaap van Zweden in one of his final concerts. “We are going to the opera,” she continued, laughing. 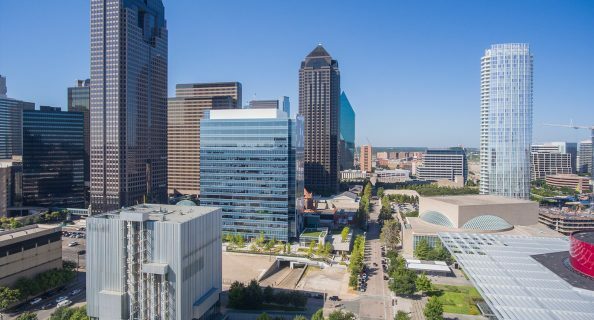 “I was caught up in the flow,” I told her, trying to make her believe that I really did know my way around the Dallas Arts District. Honestly, there’s just something wonderful about being on a street where everyone is walking to the theater. We were like an arts stampede. 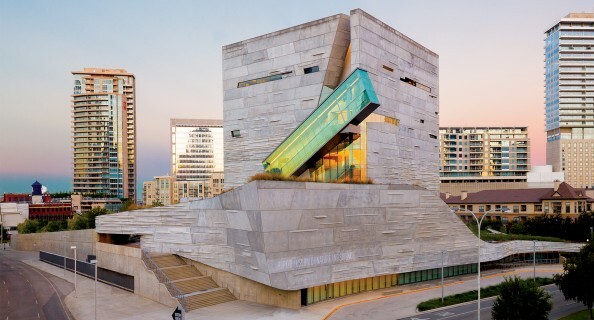 Earlier that same day, I had walked to theNasher to see First Sculpture: Handaxe to Figure Stone and the Dallas Museum of Art to see the Edward Steichen mural paintings. Seeing Michel van der Aa’s marvelously trippy Sunken Garden at Dallas Opera concluded my “art on foot” day. 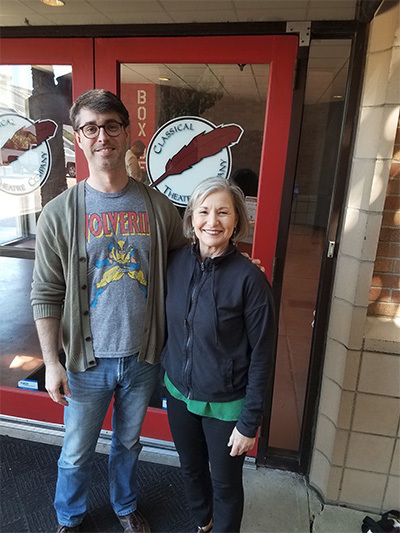 Classical Theatre Artistic Director John Johnston with Nancy Wozny in front of the Montrose/Museum District Theater. Photo by Mark Wozny. Weiss, a legend in the dance world, wants to get people in motion watching others in motion. Judging from the photos, it must have been one spectacular event to encounter on foot. 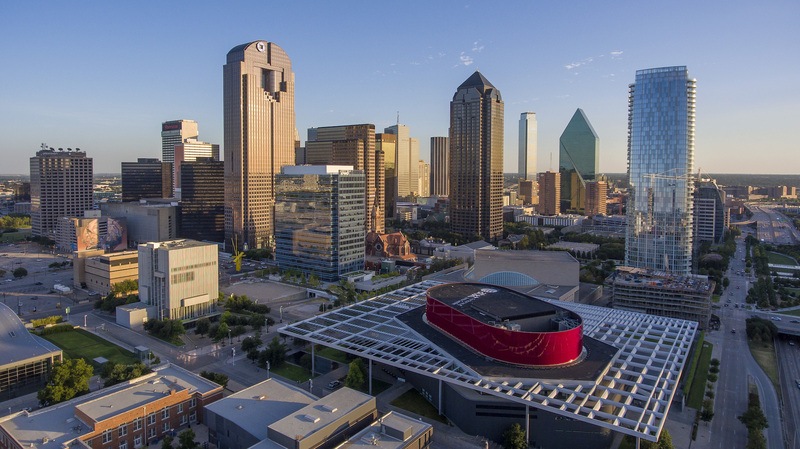 Weiss reports that audiences coming out of the Symphony and Winspear Opera House stayed to see the show. Of course they did, who could walk by dancers popping out of giant balloons way up in the air? I am writing about arts pedestrians because I am one. I wouldn’t have it any other way. 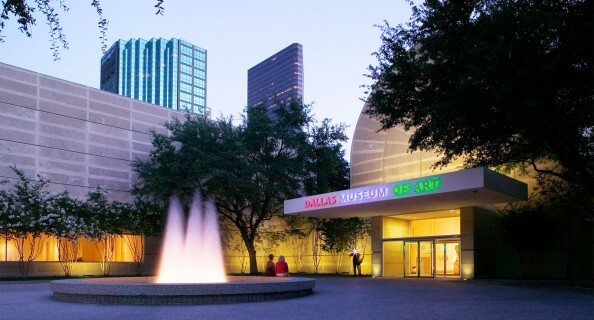 I live in the heart of Houston’s museum district; it’s a three-minute walk door to door to the MFAH, and about 20 paces to the new Glassell School of Art. Galleries, the CAMH, the Jung Center, Lawndale Art Center, Houston Center For Contemporary Craft, Asia Society Texas Center, and 4411 Galleries are so close that I don’t even need sturdy walking shoes to get there. The fact that John Johnston of Classical Theatre called me during Hurricane Harvey to ask whether I could see if his Chelsea Market space was flooded tells you exactly how close I live to his outstanding theater. Ibsen, Chekhov and Shaw are in the neighborhood. And next season the edgy Mildred’s Umbrella moves into the Chelsea Market space. Not far from there, Stages Repertory Theatre reports that the proximity to great theater is one of the reasons people are moving into the neighborhood. 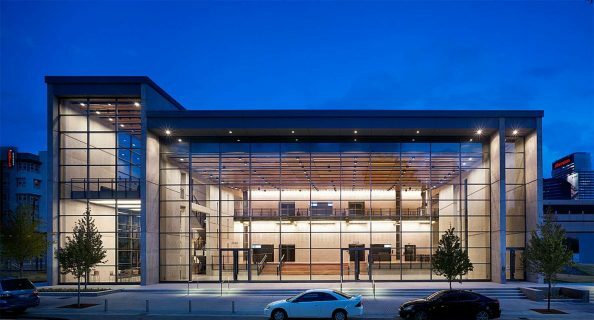 And when Stages’s new Gordy complex is complete for the 2019/2020 season they will have three shows to see under one roof! 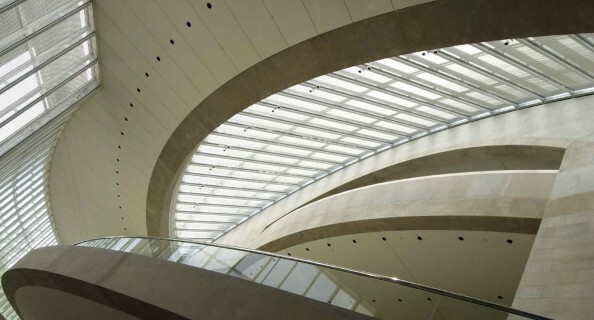 The livability of arts districts is another discussion; I sacrificed space to live in one. So, whether you can park once and visit many institutions or live in a designated cultural District, art engages us in a specific way on foot. Walking is contemplative. We process as we parade, although I have to say I wished that the walk home from Classical Theatre’s Richard III was longer. That’s a tough one to process. 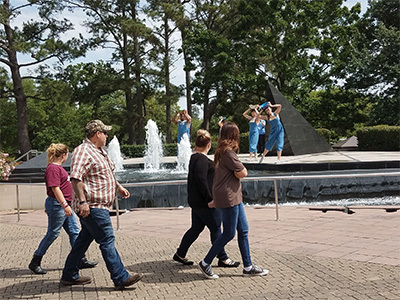 Walkers pass by Lydia Hance’s 3pm at the oasis, performed by Frame Dance in partnership with Core Dance at Houston Museum of Natural Science as part of National Water Day. Photo by Nancy Wozny. There’s art we can walk to, and then there’s art we can walk into, which has been happening to me a lot these days. And most often, it also involves people just walking on by, they might stop, take a photo, most often they watch while they walk. Really, there are two audiences: those who read about the performance and show up; and those who simply wander by. I see this as part of the outdoor on foot art experience. Art works as a walk-by experience too. 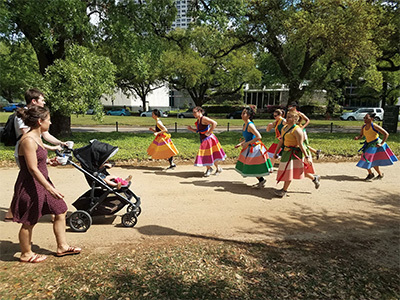 Walkers enjoy Lori Yuill’s dance as part of Color Bursting Hermann Park. More projects continue at Mason Park with Celestina Cardona Billington, Matt Fries, Julian Luna, and Chris Stevens’s Sacred Voice of The Bayou, and at Mason Park with Lisa E. Harris and Young Audiences Houston’s Free Time Flow at Macgregor Park. Austin got in on the pedestrian art action recently with Shadowing, a public art installation created by Jonathan Chomko and Matthew Rosier, where the street lights captured and projected shadows of those who walk by, so one is dancing with the last pedestrian. I liked that the project was interactive and utilized the city’s street lights, something we don’t suspect as part of an art experience. “Shadowing embodies our City’s love of quirky and unexpected experiences, and reflects our commitment to fostering innovation,” says Meghan Wells, Manager of the Cultural Arts Division. We can’t talk about pedestrian art experiences without mentioning San Antonio’s Luminaria, which is designed from top to bottom as art to be seen for walkers, with art experiences in close proximity. The pageantry of Luminaria is epic. 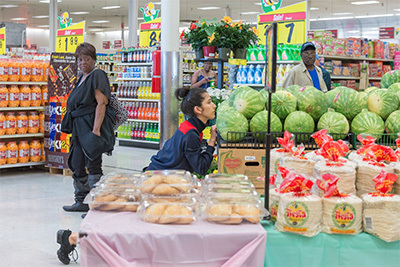 Laura Gutierrez in Center Aisle Blues at Fiesta Mart, performed as part of CounterCurrent 18, presented by University of Houston, Cynthia Woods Mitchell for the Arts in partnership with DiverseWorks and Fiesta Mart. Photo by dabfoto creative courtesy of the University of Houston Cynthia Woods Mitchell Center for the Arts. When was the last time you saw a contemporary dancer waving to the fish guy in a dance? Imagine a dancer popping up in the produce department. Those in the store during her shows witnessed something so rare, so wonderful, so surprising, and all while shopping for dinner. She ends the piece in Fiesta’s parking lot, standing on her car in her glimmering jacket with its sparkling multi-colored streamers of fringe swirling in the wind, like a beacon of beauty and calm, facing the city that formed her. 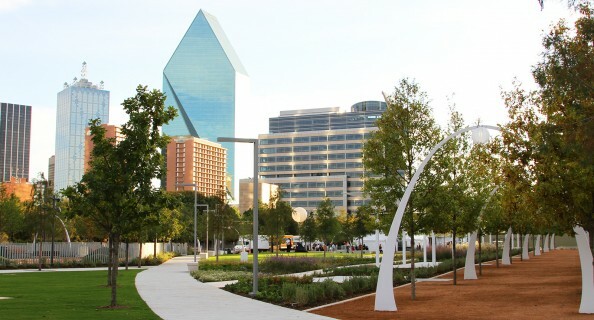 That’s some serious placemaking folks.